NASHVILLE, Tenn. – Following months of planning and construction, Nashville’s Music City Center announces the grand opening of Al Taglio Nashville, a new Roman-style pizzeria occupying the 1,670 sq. ft. street-level retail space at the corner of 5th Avenue and Korean Veteran’s Boulevard in the Music City Center. Open daily, the new fast-casual pizza restaurant offers a pizzeria and café menu “with a Nashville accent,” artfully blending traditional offerings with contemporary conveniences. The 36-seat dining space includes a café bar featuring award-winning local roaster Just Love coffee and barista beverages; a full bar featuring local beers and spirits, signature cocktails by Music City Center’s award-winning mixologist, and wines by the glass; and an outdoor terrace offers a propane fire pit and additional seating for al fresco dining. “We wanted to offer something that differentiates the Music City Center’s dining options and at the same time enhances the local restaurant scene and invites the public in for lunch, after work, or pre-show,” said Charles Starks, President/CEO of the Music City Center. The Music City Center engaged hospitality design firm Centerplate Stir to create a unique brand and to design the space and menu. 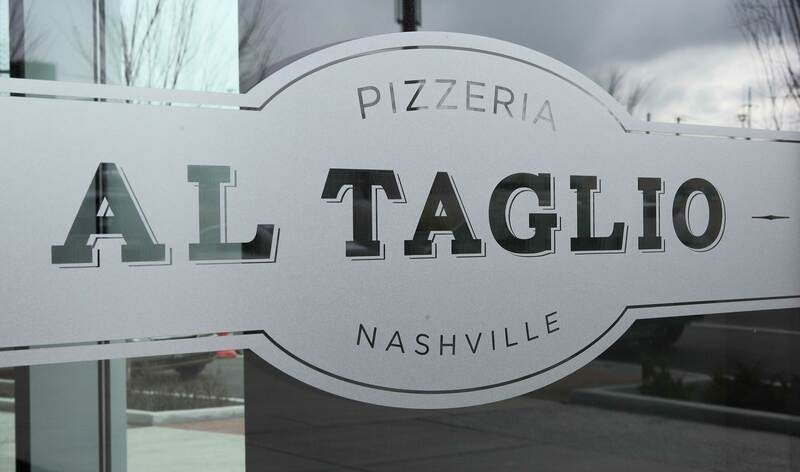 The name, “Al Taglio,” means “by the cut” in Italian and is Nashville’s first Roman-style pizzeria. Centerplate Stir surveyed the Nashville restaurant scene and considered casual dining concepts that worked for convention-goers from around the globe as well as neighbors and the local community. The results are a space and menu that is accessible and inviting, features premium local ingredients, and allows for a quiet break or a quick bite to take away. Artisan Pepperoni: generous helping of sliced pepperoni, rustic tomato sauce, grande mozzarella, pecorino romano cheese. Hearty soups, fresh salads, and generously-sized Panini sandwiches round out the menu. The quick-serve restaurant will be operated by the Music City Center’s culinary team, and is open daily to the public. Everything on the menu is all-natural, and made daily by Music City Center Executive Chef Max Knoepfel’s culinary team. The décor supports the unique blending of themes: chairs made from reclaimed ash and recycled aluminum compliment custom-made wooden communal dining tables featuring integrated power charging stations for guests accessing the free WiFi. Italian marble countertops and custom European-made cases present offerings prepared in state-of-the-art kitchen equipment designed to improve quality and speed. Even the ceiling marries a black-and-white aerial Roman cityscape with a wood slat design crafted from planks salvaged from the Tennessee tobacco barn owned by Al Gore’s family. Al Taglio (Italian meaning “by the cut”) is Nashville’s first Roman-style pizzeria and fast-casual café. Located in the Music City Center on the corner of 5th Avenue and Korean Veterans Boulevard, the restaurant will serve the local community and convention-goers in a newly designed space. The Music City Center, Nashville’s new convention center features a 353,143 square foot exhibit hall, a 57,500 square foot Grand Ballroom, and an 18,000 square foot Davidson Ballroom. The building also includes an art collection featuring local and regional artists, a covered three-level parking garage with 1,800 spaces, and is currently on track to achieve LEED Silver certification.